I figured last week’s headline (Black Skin Gives Better Protection than White: Study — AFP) would raise a few eyebrows. Well, not the headline, really, but my lead-in “slug” for it: “Except From the Police”. Take the Time to Get to Know Some Cops?! I was the Public Information Officer for the Search and Rescue team — I had a lot of nifty equipment, and took this photo myself. I asked Greg if it would it surprise him to learn that I am a former peace officer myself. He was. 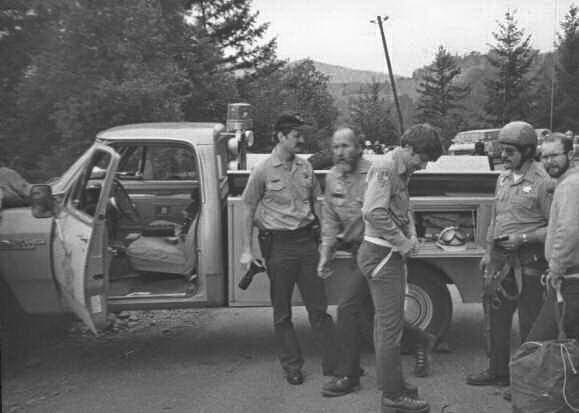 I started as a police cadet in Menlo Park, Calif., and got out of the biz some years later, after a stint as a deputy sheriff in Humboldt County, Calif., where I did search and rescue work. The photo (right) is from my neglected personal site: that’s me, in uniform, at the left, holding the camera. It’s absolutely true that most cops are terrific, hard-working men and women who are trying to make their cities better places. True is, in its essence, biting social commentary. I knew I’d hear from a lot of my black readers that my comment is right on — and I have; it’s the way many of them truly feel, and a lot of the time those feelings are based on real-life experience, not paranoia. I’ve said many, many times that while True is entertainment, part of its mission is to make people think and talk about the issues raised. We all belong to groups that have done something worthy of being laughed at — which is a damn sight better than crying! If we can learn to laugh at ourselves when those things are illuminated, we get closer to “getting along” with others (as one black man who tussled with the police once urged). Greg did tell me something I didn’t know: last week was Police Memorial Week, dedicated to the memory of officers killed in the line of duty. Thus I do have one regret with the headline: its timing. I’m fairly Establishment and a taxpayer. In other words, I pay for, and expect, police protection. And as a voter, I have my voice in City Council in how I like to see a police department operated. For the most part, I think cops are normal people doing a dirty job for less than stellar pay. Even when I get caught screwing up, like a speeding violation, I can’t complain. It IS what I pay them for. Of course, you do run into a few badge-heavy swaggering Barny Fifes who think they’re the Lone Ranger intent on saving the world from itself. They’re a small minority and eventually they do end up getting what’s coming to them. But I was curious, so I looked it up on the USDOJ site. There are 653,500 police officers in the U.S. If only 1% of them are abusing their authority, and they exercise that abuse with 10 citizens a day, that amounts to well over 16 million people each year. Enough to populate 2 or 3 small states. At 1% and 1 case of abuse each day it’s 2.38 million per year. Or 23.8 million per year if it was 10 cases per day. Thanks for your thought provoking commentary. Did you intend to create the additional enigma of the photo (which “includes you”) which you “took yourself”? Initially the apparent impossibility made me chuckle but after thinking it over I was able to resolve the anomaly (hopefully correctly). However, it further enabled me to reflect on taking the time to digest information instead of jumping to incorrect conclusions and assumptions — which, I’m sure you’ll agree, form the basis of many of the rants you receive.